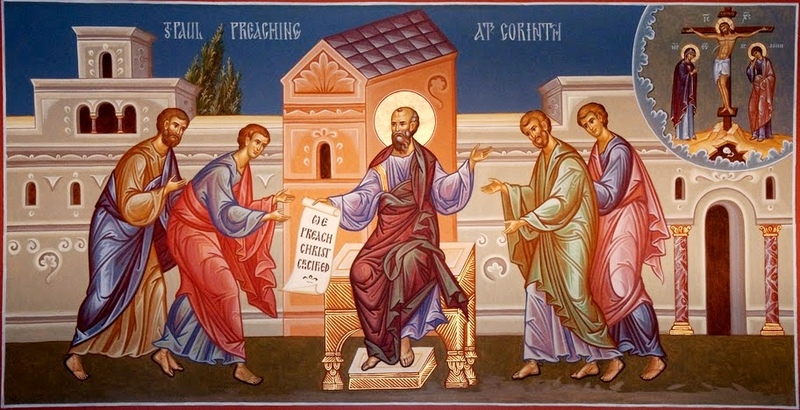 Brothers, this is the unofficial feast day of Preachers Institute, and on the feast of the glorious Apostles, Peter and Paul – the greatest preachers of the Christian faith, we offer this sermon from St. Gregory Palamas. Let these examples be before us as lamps in these dark times reminding us of our high calling, the excellence of our homiletic work, and the end for which we serve the Lord. We have received a great gift for the salvation of the people Christ loves and died for. Be refreshed in your spirit to preach and teach with the boldness of these ardent preachers, and let their prayers ignite in us the grace to preach worthily to save every soul we encounter. 1. The commemoration of each of the saints on the appointed feast day is an occasion for town and country, citizens and their rulers to share in rejoicing, and brings great benefit to all who celebrate. “When the righteous is praised the people will rejoice” (cf. Prov. 29:2 LXX). If a lamp is lit at night, its light shines for the service and enjoyment of everyone present. Similarly, through such commemorations, each saint’s God-pleasing course, his blessed end, and the grace bestowed on him by God, because of the purity of his life, bring spiritual joy and benefit to the whole congregation, like a bright flaming torch set in our midst. When the land bears a good harvest everyone rejoices, not just the farmers (for we all benefit from the earth’s produce); so the fruits which the saints bring forth for God through their virtue delight not only the Husbandman of souls, but all of us, being set before us for the common good and pleasure of our souls. During their earthly lives, all the saints are an incentive to virtue for those who hear and see them with understanding, for they are human icons of excellence, animated pillars of goodness, and living books, which teach us the way to better things. Afterwards, when they depart this life, the benefit we gain from them is kept alive for ever through the remembrance of their virtues. By commemorating their noble deeds, we offer them that praise which, on the one hand, we owe them for the good they did our Ancestors, but which, on the other, is also fitting for us at the present time, on account of the help they give us now. 2. When we call to mind what they accomplished we add nothing to their good deeds. How could we, given that we are not even competent to depict their virtue as it really is? For the sake of the sublime rewards promised by God, they strove honourably to the limit of human nature and showed us a way of life that was equally sublime. We certainly do not augment their treasures by praising them—not at all! But we do increase their bounty to us by looking up towards them as lanterns aglow with divine light, and by understanding better and welcoming the beautifying power which comes from them. “in which there is no variableness neither shadow of turning” (cf. Jas. 1:17). Not only do they bring people out of darkness into this wonderful light, but by enlightening them they make them light, the offspring of the perfect light, that each of them may shine like the sun (Matt. 13:43), when the Author of light, the God-man and Word, appears in glory. 4. The appearance to us this day of both these luminaries together brightens the Church, for their meeting produces a wealth of light, not an eclipse. It is not the case that one has a higher orbit and is placed above, while the other is lower down and passes under his shadow. Nor does one rule the day, the other the night, such that one would overshadow the other if they appeared opposite each other. Light is not produced by one and received by the other in such a way that the latter’s radiance would vary sometimes depending on the distance between them. Rather, both share equally in Christ, the everlasting Source of eternal light, and have attained to the same height, glory and radiance. That is why the coming together of these lights signifies their solidarity and support for one another and illuminates the souls of the faithful twice over. “Thou art Peter, and upon this rock I will build my church” (Matt. 16:18). Peter disobediently contradicted Him. He also exalted himself above the others, saying that even if everyone else were offended, he would not be (Matt. 26:33). Because he had been beguiled into arrogance, he fell further than the rest, so that by humbling himself more than them he might eventually appear more radiant. Unlike Adam who was tempted, vanquished and completely brought down, Peter, having been tempted and led astray a little, overcame the tempter. How? Through his immediate condemnation of himself, his intense sorrow and repentance, and the medicine which brings forgiveness, tears. “They that sow their supplications in tears shall joyfully reap forgiveness” (cf. Ps. 126:5). “Yea, Lord; thou knowest that I love thee” (John 21:15, 16, cf. 17). “Feed my lambs” (John 21:15). “From henceforth thou shalt catch men” (Luke 5:10). “Feed my lambs, feed my sheep” (John 21:15-17). It is clear from this that the Lord’s desire for us to be saved is so great, that He asks of those who love Him only one thing: to lead us to the pasture and fold of salvation. “God over all” (Rom. 9:5), by saying, “Lord, thou knowest all things; thou knowest that I love thee”, because only “God Who is over all” is all-knowing. 9. 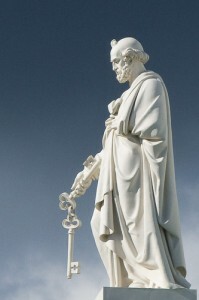 Once Peter had made this heartfelt confession, the Lord ordained him Shepherd and Chief Pastor of His whole Church, and also promised to encompass him with such strength, that he who previously was unable even to stand being spoken to and questioned by a young girl (John 18:17), would endure unto death, even death on a cross. “Verily, verily, I say unto thee, When thou wast younger”, both physically and spiritually, “thou girdest thyself”, meaning, you used your own strength, “and walkest whither thou wouldest”, doing what you liked and living according to your natural inclinations. “But when thou shalt be old”, having reached the peak of your physical and spiritual age, “thou shalt stretch forth thy hands”. With these words, Christ indicates that Peter will die on a cross, and bears witness that his crucifixion will not be involuntary. “Thou shalt stretch forth thy hands, and another shall gird thee”, meaning strengthen, “and carry thee whither thou wouldest not”, that is to say, out of this life (cf. John 21:18). Our nature is unwilling to be dissolved in death, and Peter’s superhuman martyrdom also demonstrates our attitude as human beings to life. “Strengthened by Me”, Christ tells him, “you will willingly endure all these things for my sake and bear witness to me; for the desire to do so is not natural but supernatural to human nature”. 10. Peter was the sort of man who can be described in a few words. As for Paul, on the other hand, what tongue or how many and what sort of tongues can depict even to a limited extent his endurance unto death for Christ’s sake? He was put to death every day, or rather he was always dead, no longer alive himself, as he tells us, but having Christ living in him (Gal. 2:20). For love of Christ he not only counted everything in the present world as dung (Phil. 3:8), but even put things to come in second place compared to the Lord. “For I am persuaded”, he says, “that neither death, nor life, nor things present, nor things to come, nor height, nor depth shall be able to separate us from the love of God which is in Christ Jesus our Lord” (cf. Rom. 8:38-39). “I am the least of the Apostles, that am not meet to be called an Apostle”(1 Cor. 15:9). “He is a chosen vessel unto me, to bear my name before the Gentiles and kings” (Acts 9:15). Which name? Clearly the name we have been given, the name of Christ’s Church, which rests on the foundation stone of Peter. Notice that Peter and Paul are equal in prominence and glory, and both hold up the Church. Consequently the Church now bestows one and the same honour on both, and celebrates them together with equal esteem. As we consider the outcome of their lives, let us imitate how they lived, or at least how they were restored through humility and repentance, even if we cannot attain to their other great and exalted achievements, which are appropriate to great men and fitting for great men to emulate. In fact, some aspects of their lives are probably impossible for anyone to imitate. Amendment through repentance, however, is more appropriate for us than for the great, since we all sin many times every day, and unless we lay hold of salvation through continuous repentance, we have no hope of it from any other source. 12. Repentance is preceded by awareness of our sins, which is a strong incentive to mercy. “Have mercy upon me”, said the Psalmist and Prophet to God, “for I acknowledge my transgressions” (Ps. 5 1:1, 3). Through his recognition of sin he attracted God’s compassion, and through his confession and self-condemnation he obtained complete forgiveness. because acknowledgment of our sins is followed by condemnation of ourselves, which in turn is followed by that sorrow for our sins which Paul calls “godly sorrow” (2 Cor. 7:10). After godly sorrow confession and prayer to God with a contrite heart come naturally (Ps. 51:17), as does the promise to keep away from evil from now on. This is repentance. 13. This is how Manasseh escaped being punished for his sins, even though he had fallen into many great and serious transgressions, and wallowed in them for years on end (2 Chr. 33:1-20). As for David, the Lord set aside his sin because of his repentance, nor did he deprive him of his Prophetic gift. 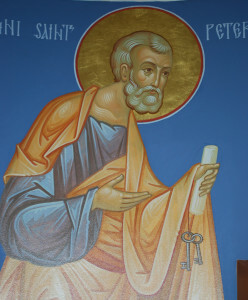 When Peter resorted to repentance, he not only recovered from his fall and obtained forgiveness, but was also appointed to protect Christ’s Church. 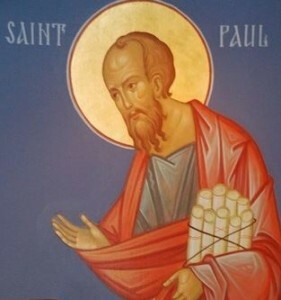 As you see, Paul too was rewarded with this role after his conversion, once he had made progress and become more closely God’s own than the others. Repentance which is true and truly from the heart persuades the penitent not to sin any more, not to mix with corrupt people, and not to gape in curiosity at evil pleasures, but to despise things present, cling to things to come, struggle against passions, seek after virtues, be self- controlled in every respect, keep vigil with prayers to God, and shun dishonest gain. It convinces him to be merciful to those who wrong him, gracious to those who ask something of him, ready with all his heart to bend down and help in any way he can, whether by words, actions or money, all who seek his assistance, that through kindness to his fellow-man he might gain God’s love in return for loving his neighbour, draw the divine favour to himself, and attain to eternal mercy and God’s everlasting blessing and grace. 14. May we all attain to this by the grace of the only-begotten Son of God, to Whom belong all glory, might, honour and worship, together with His Father without beginning and the all-holy, good and life-giving Spirit, now and for ever and unto the ages of ages. Amen. Share the post "On the Feast of Sts. 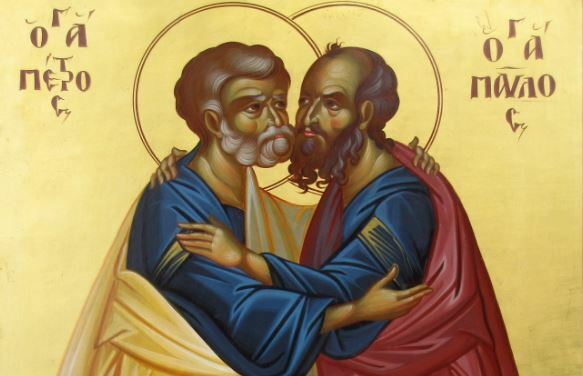 Peter and Paul, Leaders of the Apostles"